← It’s Monday! What Are You Reading? – Boats, a moose and a panda! It’s Monday! What Are You Reading? – A Seal, a lion, a picnic and a name! A trip to my favorite children’s bookstore this week, Vancouver Kidsbooks, resulted in the discovery a few new treasures that I’m excited to share with you! 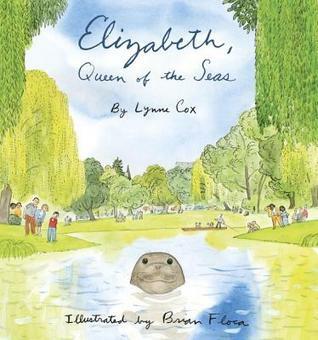 This is the amazing true story of Elizabeth, an elephant seal, who decides she wants to live in the warm Avon River near the city of Christchurch, New Zealand. At first, it is delightful novelty to have a seal living in the river, especially when she takes to sun bathing in the middle of the flat, warm road! But with the dangers of passing cars, the people decide to keep her safe and Elizabeth is towed out to sea. But somehow, Elizabeth makes her way back to the river. Each time she is carried farther and farther away, she comes back. (making a connection to “The Cat Came Back” song right about now!) The soft pen and ink watercolor illustrations by Brian Floca are lovely and the writing includes wonderful imagery that I would certainly use as an anchor book for writing: “Moving up the soft shore like a giant inchworm” (can you say simile?) I loved how there was factual information about elephant seals gently woven into the text. Background information and a photo of the “real Elizabeth” at the back of the book. A delightful book! Themes of respecting differences, global awareness, multiculturalism along a great spunky character make this book a must read for all primary teachers! Wilma Lee Wu does not like her name. So she marches into the Change Your Name Store where she meets the outrageous owner Zeena McFouz. Zeena soon convinces Wilma to try on new names in the magical store. Each time Wilma selects a new name, she is transported to the country from which the name originates. Isn’t that the greatest premise for a picture book? (I wish I had thought of it!) The illustrations are delightful and the text is written in simple rhyme. A GREAT read aloud, perfect for making connections to names, a link to social studies (I am already planning a lesson to plot Wilma’s journey on a world map with my students!) and wonderful addition to your multicultural collection! I am a John Burningham fan. I love his simple, sparse text and his pen and ink watercolor illustrations. 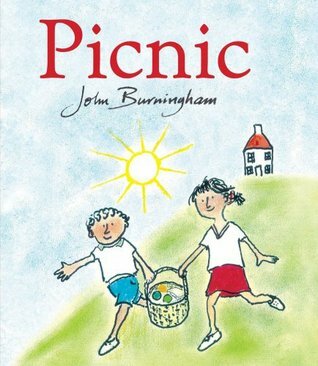 In this latest book, a boy and girl prepare for a picnic. On their way to find their picnic spot, they meet various animals and invite them to join the picnic. A uninvited bull interrupts and disrupts their picnic and there is a bit of a chase scene! Eventually, exhausted, they go home to bed! As the story unfolds, the reader is asked to spot lost items on the page. The items are easy to find but add an interactive feature for younger readers. Classic Burningham! OK – I’m a sucker for a cute cover – and this one definitely meets my criteria for cuteness! The story reminded me a lot of Michael Foreman’s”Fortunately – Unfortunately”. Pom finds some money and buys an ice cream (that’s good) but eats too much and gets a tummy ache (that’s bad). There is very little text and the illustrations are quite unique – lots of white space so you can focus on the action and Pom’s delightful expressions on each page. This would be a great anchor book to read to an early primary class and then have them create their own mini version of the “That’s good – That’s bad” pattern. This book is translated from Swedish – and I wish they had included a translation of exactly what type of toy Pim is! A cute blob with arms and legs and I want one! Thanks for stopping by! I’d love to know which book caught your eye! I am extremely interested to read THE CHANGE YOUR NAME STORE. What an intriguing title and concept for a book. Yes – it is a definite winner! Such a great book for promoting discussions on diversity and respecting differences. Have a great week! The Lion and the Bird is a title I have been waiting for. It just looks beautiful. All of these titles look amazing. I want to read each one. Isn’t it so lovely to visit Kidsbooks and find so many treasures! Happy Reading this week! Yes, Lion and Bird is a definite “Carrie” book! You will love it! So simple, yet so profound. Yes – Kidsbooks is a source of many treasures! I did my early morning shift on the picket line. What about you? Sadly, my fear is that there may be more to follow. Can’t wait to get my hands on The Lion and the Bird, thank you… Great to see these titles, thanks for the introductions! (as usual) Happy reading to you. 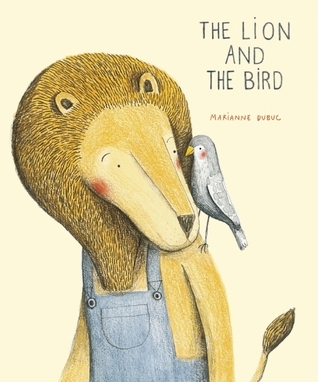 The Lion and the Bird is beautiful – simple, yet profound. I think you will really enjoy it. Have a great week! Terrific titles here, Adrienne. I’ve loved Mr. Gumpy’s Outing for a long time, so thanks for sharing about Birmingham’s new title. I recently did a lesson about naming and the students wrote about their own names. Wish I had had The Change Your Name Store for that lesson-sounds wonderful. 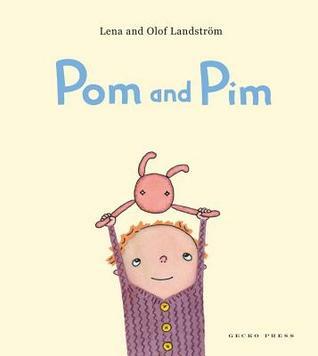 And Pom and Pim sounds delightful, a must to find. It sounds as if it would be a great mentor text for writing. Thank you for all! My favorite Burningham book is Harvey Slumfenburger’s Christmas Present – but I also love Mr. Gumpy’s Outing, too! 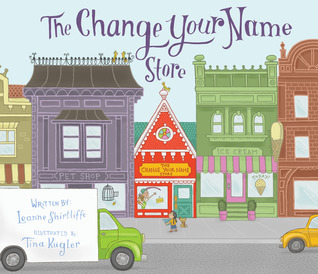 The Change Your Name Store would have been perfect for your name lesson – but one to remember for next year! Have a great week, Linda! I hope I can get a copy of The Change Your Name Store for the 48 Hour Book Challenge, since it seems to go right along with the #WeNeedDiverseBooks initiative. Sounds like fun! Change Your Name Store is certainly one that supports diversity and respecting differences. Such an original idea for a story! Hope you can get a copy for the challenge! I just wrote down The Change Your Name Store, I had not seen that title before! Margie talked about The Lion and The Bird several months ago and I’ve been waiting for my library to order it. So far, no luck! Hoping we get it at some point! Hope you have a great reading week. The Change Your Name Store seems to be the book people were most drawn to. It is certainly a wonderful and original idea for a book and is great one for promoting diversity. Hope you get a copy of Lion and the Bird soon – it is another winner! Have a wonderful week!